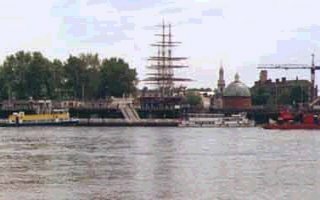 You are looking from the Isle of Dogs, across the River Thames, to the South Shore where you can see the Cutty Sark - A famous clipper ship. No one is quiet sure how this area became known as The Isle of Dogs. One story is that, when the kings and queens of England had their royal palace across the river at Greenwich, they kept their hunting dogs here; sailors passing in their ships heard the dogs barking and so named the place: 'Isle of Dogs'. Other stories include that of a murdered traveller and his dog, of a lost hunting party whose ghostly dogs barked mournfully on misty nights. Some say that the name does not mean 'dogs' at all, but 'dykes', 'boats' or 'water-lilies'. It's also been suggested that the original Isle of Dogs was just a tiny island in the Thames off Millwall. The official name of this area was Stebunheath or Stepney Marsh, so called because it was often flooded by the river at high tide. The marsh was drained in the 1600s, and a dyke was built around it so that it could be used for pasture. The pastures of the Isle of Dogs were said to be 'amongst the finest in England' and herds of cattle and sheep were brought here to be fattened up before going on to the London markets. Very few people lived here before 1800 but, since then the area has been developed by the building of docks, declined and has been rebuilt as a residential area. Click on the applet to see more of the Cutty Sark.